Understanding and facilitating the effective management of risk is our core business. Only when the risk facing an organisation is well understood can it be effectively managed. Key to the successful identification, assessment and management of risk is engagement with the right people, using the right processes at the right time. We work across all aspects of risk, from Quantitative Risk Assessments and Predictive & Consequence modelling, through to the ‘softer’ risks which may affect an organisation’s reputation. 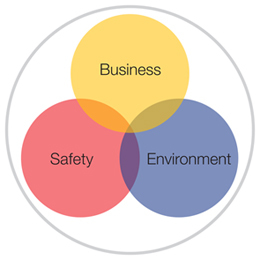 Our safety risk assessment and management expertise covers risk identification techniques such as HAZIDs and HAZOP, predictive modelling advice and the facilitation of risk management techniques, particularly in the demonstration of ‘ALARP’. We have the full range of expertise to develop Safety Reports for new developments or revisions for existing sites. We also provide training and development in process safety and COMAH, which is tailored to suit individual organisations’ needs. It could be argued that all risk – whatever its label – can be defined as ‘Business Risk’. Ultimately, whatever risk is being considered, whether safety, environmental, commercial, financial, if it’s not understood and managed effectively, it becomes a risk that affects the whole organisation. We define Business Risk as ‘softer’, more intangible risks that could affect a company’s reputation. This includes corporate regulatory compliance, as well as leadership training in process safety, change management and project risk management. The tools and process we have developed help our clients to identify threats, rank those risks and build a clear picture of the risk facing the organisation. Our services in the Environmental Risk area range from the assessment of the risks related to the environment in relation to Major hazards, based on our Source, Pathway, Receptor Risk Assessment model, through to preparation of Environmental Permits (PPC in Scotland) – full applications or variations of existing permits – particularly in relation to planning for new developments. We also provide consequence and predictive modelling, including PHAST, ADMS, and proprietary client models. Rather than ‘off the shelf’ solutions for our clients, we pride ourselves on our understanding of the regulatory framework and how it applies to particular industries and circumstances. We strongly believe in tailoring solutions to meet each client’s particular challenges and issues.